We have compiled this information to help 2B builders with the task of fitting their side panels & rear wheel arches, under no circumstances can we be held responsible for any problems of poor fit, creases etc that you may incur, YOU are responsible for your build. Once again, you need 2 people, 3 are better. Don't try it on your own, you will bugger them up!! You need to be aware of the possibility of scratching the stainless. Work on protected surfaces, use tape to "centre" your drill into so that it doesn't skim off and scratch the metal. Click onto the small picture to go to a large copy of it. It is very important that you prepare your arches before progressing. You do not want any sharp burrs or roughness along the long edge of the panel, as this will scratch your fibreglass piece when assembling. First file off any roughness, then finish off with some emery paper until smooth all along. Bend up the "fingers" making sure that you bend them right into the "root" of the cut. A pair of Mole grips are good for this, but make sure that they will reach to where the bend needs to be. This is were you need many hands. 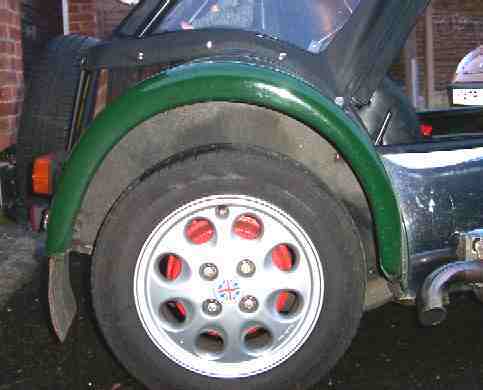 With the arch now held up to the chassis rail, the rear of the arch is positioned both level with the bottom of the panel, and where it needs to be towards the rear boot panel. 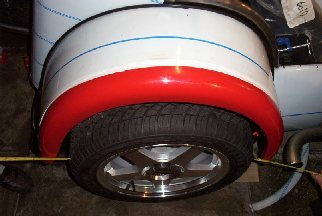 We have cheated here, by using a cardboard template taken from a car already built and known to be good, we have used that the position the rear edge of the wheel arch. Still holding the arch up against the chassis tube, and in position at the rear, now look at the front edge where it joins the side panel. It's a good bet that the curve of the side panel and the curve made by the "fingers" in the wheel arch don't match. With your felt pen, hold it the same distance from the side panel, run it down the panel and draw a line onto the wheel arch where you need the curve to be. 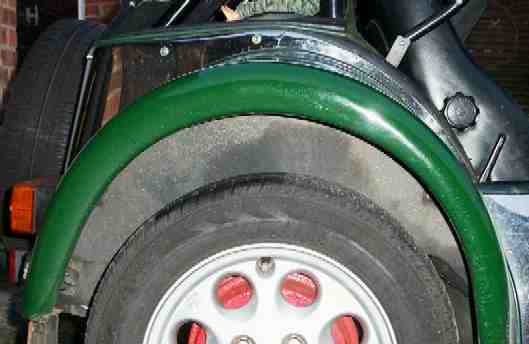 Alternatively, if you've made the side panel fit the wheel arch, you may not have a problem here. Straighten out the fingers that need adjusting, and cut down to the line using the tips of the cutters, or a hacksaw. Trim some length off the fingers that are now longer, then rebend the fingers now down to the line. With many hands (making sure that you don't scratch the side panel!) try the fit again, adjust the odd finger if necessary. Now you have to bend inwards, the rear-most edge of the wheel arch at the "notch" Clamp it with G clamps and a couple of pieces of wood, check that it's equal length at both ends, then with the rubber mallet, form it over the wood. You now need to decide which of the fibreglass pieces is for which "hand" RS. says that the shorter one is for the exhaust side. Drill a small hole (3mm bolt) through the fold of the metal, and then through the fibreglass with approx. 10mm overlap and fix them together with a 4mm nut & bolt. Carefully pull outwards on the fibreglass until there is about a 10mm overlap all around the edge. The metal MUST be tight on the fibreglass, if not do it again! This is where scratches are made in the fibreglass if you've not prepared your edges well. Get this right or it will look awful!! To assist, so that the fibreglass stays where it's supposed to be, tape it in place along the joint. What you will now find, is that at the rear end of the arch, there will be a small gap between the metal and the fibreglass. You could possibly put a small wedge in from underside between the metal and the fibreglass to close the gap, or do as we have and fitted a small dome-headed nut & bolt about 20 mm up, to pull them together. Cut the end off the silicone tube as small as possible, push it into the joint, and squeeze it in, don't be frightened of using too much, you can't. Wet your finger, then smooth the excess into a nice bead over the joint. Make sure that nothing has moved (it shouldn't if you got it "tight" enough!) then put them out of the way for at least a week before fitting them to the car. Now do the other one. Good luck! patience is the rule. OK, now we start to actually fit the wheel arch to the car. First job is to pre-drill all the tabs on the wheel arch, I would drill them 1mm smaller in dia than you later require, this centres your drill later on, but you only have a little metal to drill out of the one thickness. Next, offer the wing up into position, checking the gap between the wing & the wheel. Clamp it all into place with the "tadpole" beading between the wing & body. 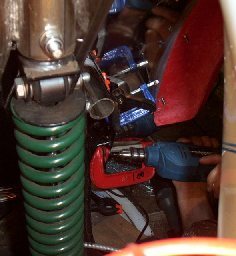 Once it is clamped up securely, then remove the wheel and drill through the pre-drilled holes with a 4mm drill and fit a screw to hold it, ONLY drill 1 at a time, and do the end ones first, and bolt each one up as you do them, this is to ensure that things don't move. Trim the beading very slightly shorter than the wing. Once you have done this, then the screws can be replaced with either 4mm stainless "pop" rivets, or 4mm stainless domed headed setscrews & nuts etc. but when fastening it on for the final time, remove the plastic coating from that area first, as it's a SOD to get off later. 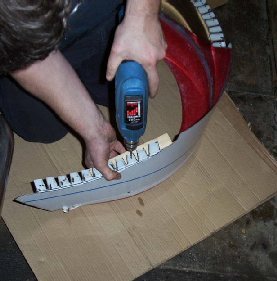 The stone guard can easily be fitted, first decide how big you are going to have them, then make a template of the curve of the wheel arch (if you still have the original one from earlier, that should do) and cut you stone guards to size, check the fit, then pre-drill for the rivets. On this car, Mitch drilled 1" apart, and �" in from the edge. Again, remove the plastic from the rivet area before finally fitting them. Hold the arches in position and clamp them, both at the front & back, and up to the inside of the curved tube. If you're happy with the fit, and clearance around the tyre etc. Drill through one tab at a time & rivit it, first the front, then one at the rear, checking that things are going together correctly (don't forget the 'tadpole' beading if you are fitting it) make sure that it doesn't move as you drill through. Also rivit up into the bottom of the chassis tube for that part that runs underneath there. You should be left with a small area about 1" wide, over the top of the wing following the curve of the chassis, that needs a 'fill in' panel making and riviting in place. you may need to adjust the ride height by altering the rear suspension, but it will settle some when first used. When it comes to the time to fit the hood press-studs, these are rivited into the side of the chassis tube.